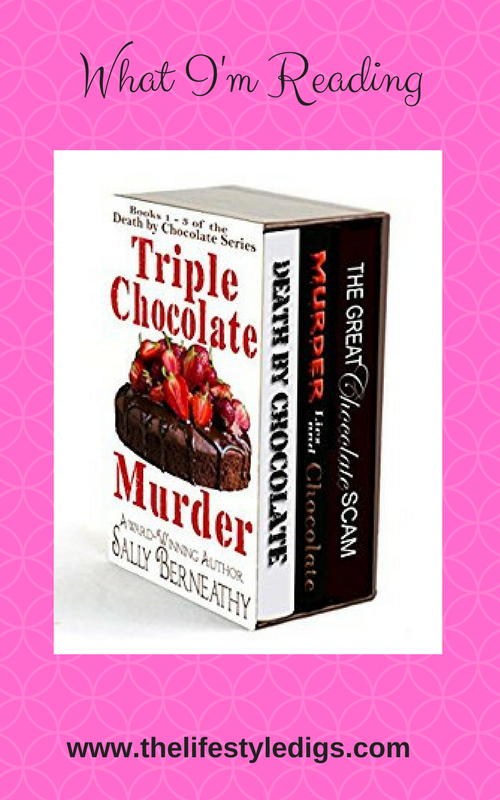 This week I’m reading Triple Chocolate Murder: Books 1, 2, & 3 Death by Chocolate Series. Disclosure: this post contains affiliate links and if you click and make a purchase from Amazon, I’ll receive a small commission for the referral. I’ve read the first book in the series, Death by Chocolate. This is a typical cozy mystery. Lindsay has a regular career, in this case owns a chocolate bakery, becomes an amateur sleuth. Check off one boyfriend in law enforcement and add a touch of humor and you’ve got the standard blueprint. Not to mention I love all the chocolate happening in the novel. Throw in one ex husband who’s dragging his heels on signing the divorce papers. She’s a big Coke drinker and I’m more of a Dr. Pepper person, but I’ve sure been craving the Coke this week! I’m now on Book 2, Murder, Lies and Chocolate. Book 3, The Great Chocolate Scam, is coming up. I read another book by the author, Sally Berneathy, a year or two ago. It was called The Ex Who Wouldn’t Die and it was about a woman who owns a motorbike shop and her ex husband comes back as a ghost. Interesting concept for a cozy mystery. I’ve just finished reading the latest in the Aloha Lagoon Mystery series, Bikinis and Bloodshed, by Anne Marie Stoddard. This novel features Kaley, who’s just divorced her pro-athlete husband in a very public manner, and moved back to Kauai where she helps her aunt run a boutique at the Aloha Lagoon Resort. This is Kaley’s first appearance and apparently the author has a sequel in the works. There are several writers who are contributing to the Aloha Lagoon Mysteries and what I’m liking is they’re returning with more of their character’s stories. I saw this recently with Leslie Langtry’s Ukulele Deadly, a sequel to Ukulele Murder. This is Nani’s story, and she’s a ukulele performer. So far I’ve found Leslie Langtry to be the strongest writer in the series. That’s not to say most of the other authors haven’t come up with great story lines and characters. Actually there’s only been one book in the series that’s been weak and unfortunately I see there’s a sequel coming soon. Waiting in the wings, I still haven’t got around to reading a 4 book series called The Forgotten Coast Florida Suspense Series Books 1 – 4, Lucky Double, The Bikini Baristas, and Hawaiian Hangover among others. As you can see, I tend to favor books that take place in tropical settings!